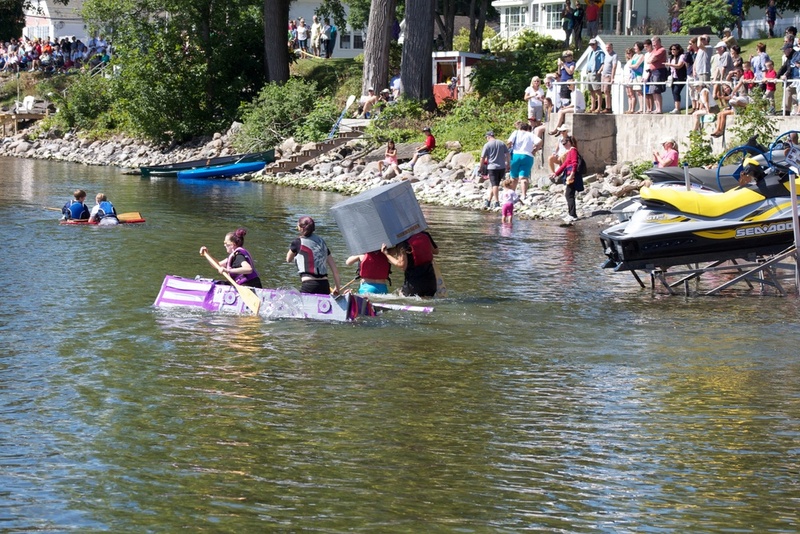 We made a family trip to the Annual Duct Tape Regatta in North Hero, Vt. yesterday. The rules are simple. No power boats, strictly paddle, and your materials are limited to cardboard and duct tape: no glue, staples, struts, ballast, or flotation. Paint may be used for decoration, but not as a waterproofing element. The only non-duct tape materials I could see being allowed were the crew, their PFD's and their paddles. In spite of the material limitations, we saw an impressive variety of designs. Boats ran the spectrum from the "tape-coated box" to Land Tortoise, to kayak, to rafts of cardboard tubes. We learned a few things along the way. Cardboard boxes simply coated in duct tape are not very stable. Ditto for approximations of boats, but they're fast if you can handle them. Steering is clearly a challenge, though. Rafts made from cardboard tubes are sturdy, stable, and all around dependable, although not necessarily very fast. They seems particularly well suited for larger groups of passengers. At least some of the competitors managed to stay dry, and it looks like all of them had fun. Maybe we'll have to look into competing next year.